The Eighteenmile Creek watershed is located along the southern shore of Lake Ontario in Niagara County, New York. 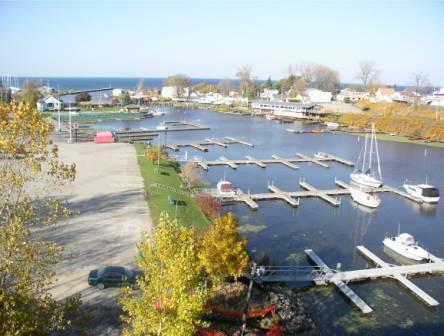 Eighteenmile Creek flows generally to the north and discharges into Lake Ontario, through Olcott Harbor, approximately 18 miles east of the mouth of the Niagara River. The watershed has a drainage area of approximately 58,056 acres and includes Eighteenmile Creek; the two main tributaries, the East Branch and the Gulf, and minor tributaries. In addition, much of the flow in the main branch of Eighteenmile Creek comes from water diverted from the New York State Barge Canal. The natural topography of the area can be characterized as two relatively flat plains at different elevations separated by the Niagara Escarpment. The southernmost portion of the watershed is at a higher elevation than the remainder of the watershed and is separated by the Niagara Escarpment along the northern portion of the City of Lockport. The watershed lies entirely within Niagara County and encompasses portions of the Towns of Cambria, Lockport (including a portion of the City of Lockport), Royalton, Hartland, Newfane, and Wilson. The majority of the watershed can be characterized as a rural area comprising agricultural lands, with scattered residences along roadways, and rural villages; including Olcott, Newfane, and Gasport. A portion of one urban area, the City of Lockport, falls within the watershed and is the most densely populated area within the watershed. Commercial and industrial uses are concentrated in the City of Lockport. The main branch of Eighteenmile Creek originates southeast of the City of Lockport, in the vicinity of Keck and Chestnut Ridge Roads, on the south side of the Niagara Escarpment. It travels northwest through the city and is diverted underground near Vine Street, travels north underground under the Canal to a point near Clinton Street, where it resurfaces. It continues generally north, descending approximately 240 feet over the Niagara Escarpment and flows north through the Town of Newfane before draining into Lake Ontario at Olcott Harbor. A section of Eighteenmile Creek was designated as an Area of Concern (AOC) by the International Joint Commission because of an existing fish consumption advisory, benthic population decline, a degradation of fish and wildlife populations, prevalence of bird and animal deformities or reproductive problems and restrictions on dredging. 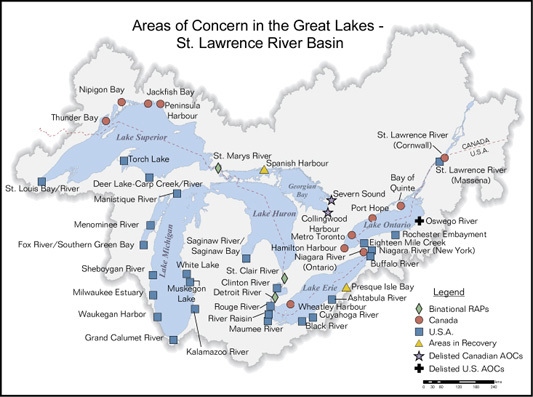 Over the years, numerous contaminants have been identified in creek sediments which have a detrimental effect to the AOC and Lake Ontario. These contaminants include but are not limited to; Polychlorinated Biphenyls (PCBs); Mercury; Dioxins and Furans; Dieldrin; Mirex; DDT; Lead; and Copper. Sediments contaminated with these substances have directly contributed to the impairments just mentioned. Interestingly enough, the AOC is relatively pristine to the naked eye. This section of Eighteenmile Creek flows through a steep sided, undeveloped wooded gorge, where habitat disturbances are minimal. The extensive beds of emergent and submergent aquatic vegetation in this area account for an estimated 65 acres, comprising one of the largest coastal wetlands in the western portion of Lake Ontario. These wetlands and undisturbed woodlands bordering Eighteen Mile Creek provide valuable habitats for wildlife that are uncommon in Niagara County's coastal area. A variety of bird species inhabit the area, including great blue heron, green-backed heron, mallard, wood duck, belted kingfisher, marsh wren, common yellowthroat, red-winged blackbird, and swamp sparrow.. Eighteen Mile Creek is particularly significant because large concentrations of Coho and Chinook salmon and brown trout migrate from Lake Ontario into the creek each fall. In addition, steelhead migrate into Eighteen Mile Creek during the fall and between late February and April. Due to the importance of this area, NYSDEC has determined that, “Disturbances of wetland vegetation, including submergent beds, through dredging, filling, or bulkheading [excluding Olcott Harbor], would result in a direct loss of valuable habitat area." The mission of the Eighteenmile Creek Remedial Action Plan (RAP) is, to restore the chemical, physical and biological integrity of the ecosystem in the Eighteenmile Creek Area of Concern in a manner that reflects the communities concern for the preservation and protection of the waterway. Specific goals of the RAP are the protection and enhancement of human health, fish and wildlife, aesthetics, recreation and the economy of the Eighteenmile Creek Area of Concern. Bathing and aquatic life have been established as the best uses of Eighteenmile Creek through a public process under the New York State Stream Classification System. The RAP is designed to restore these uses where they have been impaired and to move toward the reduction of all sources of pollutants. Due to the cost and extent of contamination in Eighteenmile Creek, the NYSDEC requested the Eighteenmile Creek Sediment Site be nominated to the National Priorities List (also known as Superfund). Eighteenmile Creek was placed on the National Priorities List in 2012, breaking the site into three different Operable Units (OU). OU1 includes the relocation of residents on Water Street and demolition of the homes as well as the former Flintkote factory. 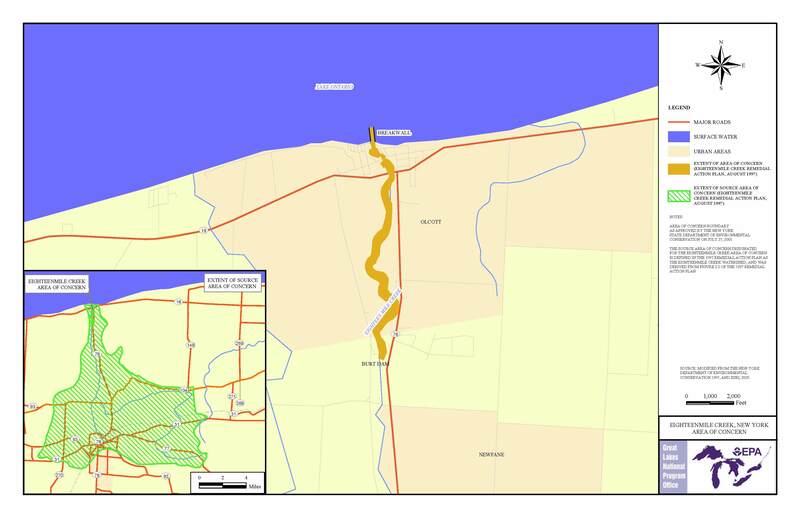 OU2 includes soil remediation of the Creek Corridor (several parcels of land in the City of Lockport between the Barge Canal and Harwood Street). Lastly, OU3 involves remediation of approximately 15 miles of creek sediments from Harwood Street in the City of Lockport, to Lake Ontario. The RAP has worked very closely with Superfund to ensure that work being completed will contribute to both Superfund and AOC objectives.